Max loves to ride horses. This summer we went up to Snowflake to visit a dear friend Nancy. 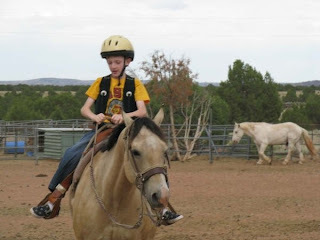 Nancy made it possible for Max to ride a horse. He loved brushing the horse, and walking it. He loved being on the ranch and enjoyed the out doors. MAX HAS A NEW FIXATION! My Friend Laurie reminded me last night that I needed to update Max’s blog. So, here is an update. Last week when I took Max to Occupational therapy he had to pour out his thoughts to his therapist. He told her and I will try to quote it. I about fell out of the chair as I listen to him talk. The therapist looked over at me and then back at Max who was now running around the waiting room. I told her I never told him that. Found out later my Daughter in law Haylee told him that. I was pleased that she had shared that with him and that he remembered. Now he talks about it at least three to four times a day. Last night he asked me who is going to die next. He is so fixated on death. Often still he brings up my parents who are now gone. I wonder if he can feel them near him throughout the day. A lady at church approached me last week and asked me why Max’s grandma comes to Primary with him. She said she can feel some spirit with him each week he is in primary. I know my mom is there to comfort him and guide him to behave. My mother loved primary. The Primary President said Max is so animated during singing time. He can’t sing the words, but he dances and makes noises. I guess that is a good thing that he loves to be in singing time. Max got a mark on his communication report that he was humming all day at school. 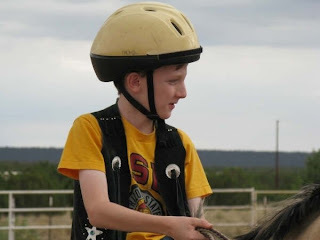 Life with a special needs child makes life worth living for. My prayer tonight will be that he doesn’t continue the humming.